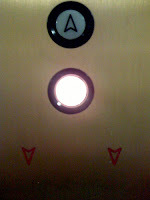 Common knowledge: You press either the "up" or "down" button to summon the elevator. And then you stand there and wait for said elevator, right? Only idiots: Walk up to the elevators where others are already standing around waiting, the buttons having already been pressed, and push the button again. Just for good measure? Because only YOUR touch will make the elevator arrive quicker? How about when people push the button repeatedly as if the more you push it the quicker it comes. There's just something about a button that begs to be pushed. The song "Love in an Elevator" now comes to mind. Yes, I tend to think of songs to go with most situations. Although this song doesn't apply to the situation, the "going down" part does!! A little Aerosmith can't hurt anyone!! Oooh, do go catty on us more often. This was delicious! I believe that if there were an actual census on the amount of total idiots, it would surpass the rest of the population. Well, of course, because obviously, the first person who pressed the button (aka "You" or "Me") is an idiot or it would have come already. Ugh I hate that too. I also hate when I am feverishly working and someone comes up to my desk and asks, "Are you busy?"